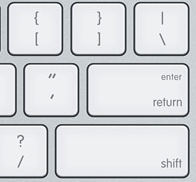 What is the Mac keyboard key with a symbol ⌅ of an up arrow pointing into a horizontal line? It's the symbol on the right I'm asking about. After much searching, I found it on the far bottom right of the full-size Apple keyboard. It's the... enter-like key (?) in the bottom right of the numeric keypad. Is it possible to trigger this key (for use in keyboard shortcuts) when using a keyboard without a numeric keypad (like a wireless keyboard or laptop keyboard)? If so, how? It is called Projective, with Unicode U+2305, and it represents Enter which is different to Carriage Return, represented with a ↩. Although most of the time they work in the same way, there is a difference between Enter and Carriage Return. While Enter, in most cases, will make a GUI object operate at its default function, the Carriage Return is meant to reset the user's position to the beginning of the line of a text. Just doing fn+Return should trigger it. On the short keyboards you'll either find the name or the icon. On my Mac, there is a Help menu. Strange but true! In Finder Help, searching "symbol" I found "Symbols used in shortcuts". Your symbol is in there. When used in this way, I would just call this symbol by the name "enter". This is the ⌤ 'Enter Key' character, which is distinct from the similar ⌅ 'Projective' character. 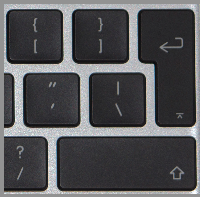 The "Enter" key is commonly labelled with its name in plain text on generic PC keyboards, or with the symbol ⌤ (U+2324 up arrowhead between two horizontal bars) on many Apple Mac keyboards. Not the answer you're looking for? Browse other questions tagged mac keyboard internationalization unicode . What is this modifier key? How do I find the key that looks like ^ with _ on top of it? What are these two keys, ⇞ and ⇟? How can I make the enter key on my extended keyboard act as return only? AltGr keyboard shortcuts on MacOS? How to use fn-key (function keys) with an external keyboard that has no fn-key? Is an external keyboard with the keys from the new Macbook available for purchase?